He incorporates hysterical, historical, and histrionic observations on the Bard by notable personalities, ranging from David Garrick to George Bernard Shaw to Stevie Wonder. 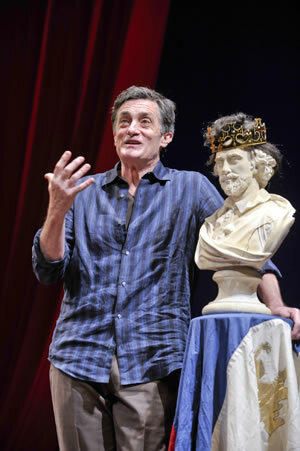 Tony Award winner Roger Rees will perform his one-man show, What You Will, in a special appearance at the Orlando Shakespeare Theater in Partnership with University of Central Florida, Feb. 29, at the Lowndes Shakespeare Center. Rees replaces Brian Bedford who, due to scheduling conflicts, will be unable to perform his one-man show, The Lunatic, The Lover and the Poet, as previously announced. Best known to American audiences for roles on Cheers and The West Wing, Rees won both the Olivier and Tony Awards for his performance as the lead character in the Royal Shakespeare Company’s 1980 production of The Life and Adventures of Nicholas Nickleby. With What You Will: An Evening By and About the Bard, Rees created and stars in a solo journey celebrating Shakespeare’s works. There’s Romeo, Juliet’s foolish Nurse, gory Macbeth, Hamlet, and the oh-so-tragic Richard II. He incorporates hysterical, historical, and histrionic observations on the Bard by notable personalities, ranging from David Garrick to George Bernard Shaw to Stevie Wonder. Rees performs snippets of Shakespeare, peppered with anecdotes about his own and others’ experiences and opinions of the Bard. “We are thrilled to have Roger join us for this special evening, and we fully expect to see Brian Bedford perform at Orlando Shakes in the future,” Jim Helsinger, Orlando Shakes Artistic Director, said in a press release. In television, Rees starred in the British sitcom Singles, appeared in episodes of My So-Called Life and played British Ambassador Lord John Marbury on The West Wing. For a decade, he portrayed the dashing, feckless English tycoon Robin Colcord on the popular television sitcom Cheers. His film career includes Mel Brooks’ Robin Hood: Men in Tights, Frida, and The Prestige. Recently, Rees replaced Patrick Stewart as Vladimir in the revival of Waiting for Godot, alongside Sir Ian McKellen. He is currently playing Gomez in The Addams Family on Broadway. His upcoming work includes directing Peter and the Starcatcher, scheduled to open on Broadway next spring.